Jason seems destined to screw things up. After capping off a burglary and a bar fight with a car wreck, he quickly finds himself on the wrong side of the law. And since his father's the governor, that means his punishment is about as public as it gets. Jason's thrown into the first Scared Straight program Florida has ever run in their updated, state-of-the-art Blackenbush Penitentiary. Along with a documentary crew led by Sasha, a young woman in way over her head, and a handful of other kids a year and a strike away from jail, Jason comes face to face with his inevitable future on the other side of a heavily guarded prison wall. But that's just the beginning. The tour has barely begun when one of the inmates makes a move. Before long the entire penitentiary is under siege, surrounded by the feds and overrun with prisoners let loose from their cells. Jason slips away with Sasha in the chaos, but they won't be able to escape without help. And the only thing worse than being stuck in prison, is being stuck in a prison run by the inmates. I haven't read many YA thrillers, but the ones I have read (like The Girl in the Wall and The Girl Who Was Supposed to Die), I've really enjoyed. Uncaged was no exception. I loved this exciting and sometimes downright scary novel! And I'm not just talking about the cover, although the cover does freak me out a little. This was one of those times I was happy to be reading an e-book and not see the cover each time I picked up the book. It's appropriate to the story but the eye just scares me! I had a vague idea of what the Scared Straight program was, but never considered the specifics of it. I loved that Scared Straight---along with a really surprising and well-planned prison break---was the premise of this book. It made Uncaged unique and fun to read. Jason is the governor's son and he's been getting into trouble since his mom died. He's acting out, doing dumb things. The governor enrolls Jason in the Scared Straight program: Jason, along with other teens, will go into a prison and be a prisoner for a few hours. The idea is that actually being booked into prison, and being locked up, if only for a few hours, will be a wake-up call for the young men to change their ways. I liked that Jason is a realistic, everyday teen. He's not heroic or selfless; instead, he's selfish and a little hedonistic. Jason's emotional maturity was appropriate for his age. So often in YA literature, the protagonists are too adult: too smart, too emotionally mature, too altrustic. I liked that Gazzam wrote Jason as a normal teen. 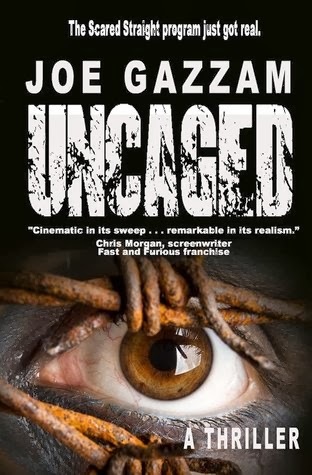 Uncaged had a really exciting plot which was full of surprises. There was a lot of depth to the plot, which I loved. I never quite knew what would happen next. 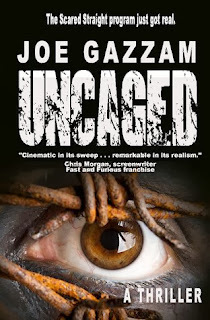 Gazzam's pacing was perfect: Uncaged was intense and the "I'm only reading one more page" feeling stayed with me for the entirety of the book. Uncaged reminded me of some of my favorite television shows, like Prison Break and 24. It had that same feeling of heightened emotions, great pacing and an intricate plot. The conflict resolution was perfect for the story. I loved the epilogue and how the characters' lives were changed. Despite the majority of this book taking place in one day's time, I felt like there was a lot of character growth, which made me happy. If you're a fan of YA thrillers, I highly recommend Uncaged. I'm looking forward to reading more from Joe Gazzam!